Top 10 Singles of 2016: Nowadays independent music is getting huge highs and now music is not solely dependent on Bollywood movies. 2016 has been a great year for Hindi music, especially for the indie music scene. This year has witnessed growth in a number of singles released. The remake trend also got popularity this year. Many singles were released this year and here are the TOP 10 of the singles released this year. Arjun Kanungo's single with a beautiful music video directed by Vivek Chauhan, it also features Sonal Chauhan. The song is composed by Arjun Kanungo, Ludwig Lindell, Ylva Dimberg and has lyrics penned by Mayur Puri. The song is sung by Rahat Fateh Ali Khan and has music produced by Abhijit Vaghani while new lyrics are penned by Rashmi Virag. The music video directed by Pradeep Sarkar features Ayushmann Khurrana & Amy Jackson. An original song sung and produced by Zack Knight and released by T-Series. 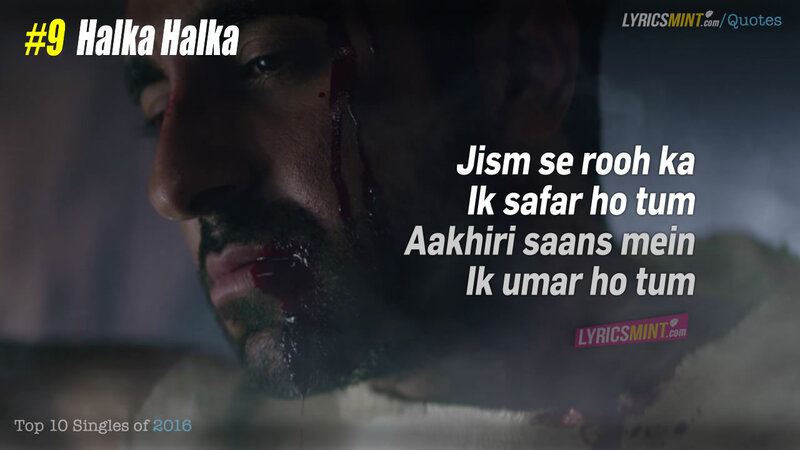 This song is composed and written by Ayushmann and his brother Apaarshakti Khurrana features Neha Sharma's sister Aisha Sharma while music video is directed by Pradeep Sarkar. A remake single of Sukhbir’s Punjabi song by T-Series, starring Urvashi Rautela and Vidyut Jammwal. The song is produced by Meet Bros featuring Rap by YoYo and vocals by Neha Kakkar and Sukhbir. After previous year's Chal Wahan Jaate Hain's huge success T-Series came back with Tiger Shroff. This one is sung by Meet Bros & Aditi Singh Sharma. 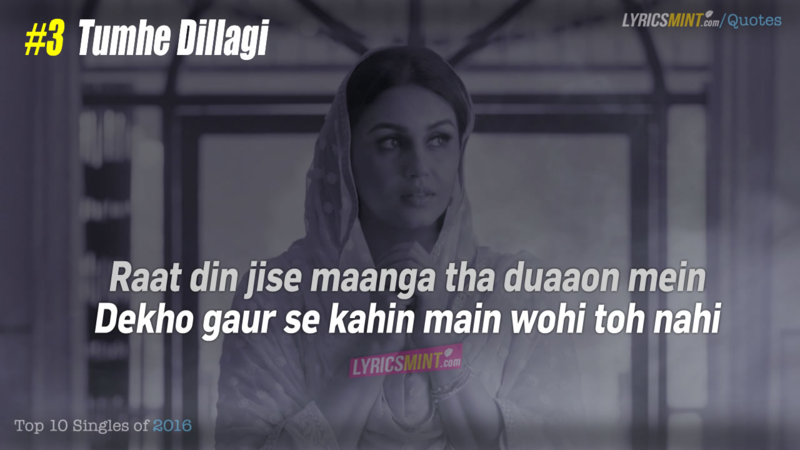 The lyrics are written by Kumaar. The music video is very well directed by Sam Bombay, features Tiger Shroff and Disha Patani. The song is sung by Rahul Vaidya and composed by Jeet Gannguli featuring Karan Kundra and Ruhi Singh. It has lyrics penned by Manoj Muntashir. Rahat Fateh Ali Khan’s song based on Ustad Nusrat Fateh Ali Khan classic “Tumhe Dillagi Bhool Jani Padegi”. It is sung by Rahat and has new lyrics penned down by Manoj Muntashir. The music video features Huma Qureshi, Vidyut Jammwal and Pakistani singer Rahat himself. This dance-based short film directed and choreographed by Remo D’souza got very popular on YouTube. It featured Jacqueline Fernandez and Sooraj Pancholi in lead. The song was written, sung and composed by Gurinder Seagal. And here is the No #1 single of 2016. The song is a beautiful recreation of Kishore Kumar's song by Abhijit Vaghani. 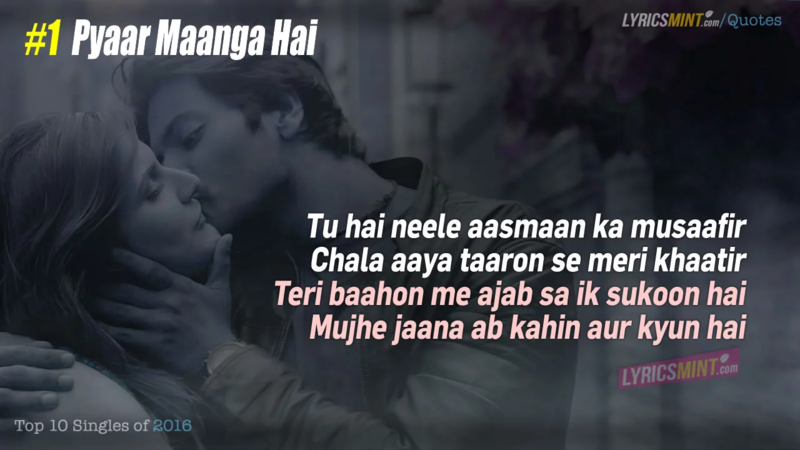 This one is sung by Armaan Malik and Neeti Mohan. The song is shot on a large scale featuring Ali Fazal and Zareen Khan. This song is too hot but the confidence and ease of leading artists never made it vulgar.